PLA vs. ABS: Which 3D printing filament should you use? Perhaps the most important part of 3D printing is using the right material for your print job. When considering what building material to use, there are numerous factors to consider, including strength, flexibility, accuracy, and special conditions the material may require in order to print properly and accurately. ABS and PLA are the two types of materials 3D printers currently use, but the differences between the two aren’t immediately apparent. 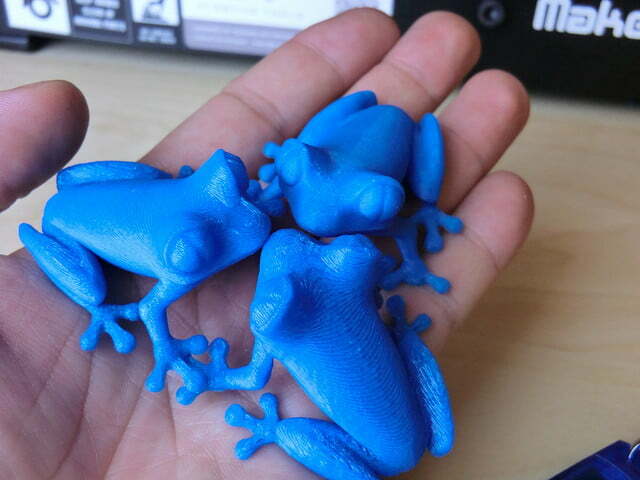 This raises the question: which is best suited for your 3D printing needs? First, let’s define what exactly the two materials are. Both ABS and PLA are thermoplastics. Thermoplastics become malleable when superheated, thus allowing you to mold and sculpt them into different shapes prior to cooling. Moreover, you can repeat the process without affecting the integrity of the material. While both are used for making objects in 3D printing via similar processes, ABS and PLA differ in some key ways, and therefore some printers will only utilize ABS or PLA — or both, depending on the machine at hand. That said, below is a quick glance at the merits of each thermoplastic in case you’re wondering why the distinction exists to begin with. ABS, short for Acylonitrile Butadiene Styrene, is an oil-based plastic. It is a strong, sturdy material that businesses widely use for constructing things such as plastic car parts, musical instruments, and the ever-popular Lego building blocks. ABS has a high melting point, and can experience warping if cooled while printing. Because of this, ABS objects must be printed on a heated surface, which is something many at-home printers do not have. ABS also requires ventilation when in use, as the fumes can be unpleasant. The aforementioned factors make ABS printing difficult for hobbyist printers, though, it’s the preferred material for professional applications. PLA, or Poly Lactic Acid, is made from organic material — specifically cornstarch and sugarcane. This makes the material both easier and safer to use, while giving it a smoother and shinier appearance that’s more aesthetically pleasing. The thermoplastic is also more pleasant on the nose, as the sugar-based material smells slightly sweet when heated opposed to the harsh smell often associated with ABS. However, while PLA might seem like a better overall choice at first glance, it features a far lower melting point than ABS. This means that using printed parts for mechanical operations, or even storing them in high-temperature locations, can result in the part warping, cracking, or melting. The material is also weaker than ABS, though, it can achieve a superior level of print detail and is less prone to errors while printing. All things considered, there are some similarities between the two. Each requires a dry location for storage given the materials are prone to melting and warping, and furthermore, each is susceptible to moisture. Both ABS and PLA also smell while printing, as heating the thermoplastic gives off fumes. That said, it’s the print temperature that primarily affects intensity of said fumes — not so much the material itself. Yes, ABS will smell like hot plastic and require ventilation while PLA will smell mildly sweet, but the strength of these smells is going to be dependent on your printer. However, there are also major differences between the two thermoplastics. ABS is going to give your projects better structural integrity and will be more suited to mechanical use given the material can better withstand the elements, but it will also require specific types of printers and printing surfaces. On the flip side, PLA will give you more precise prints and better aesthetic quality, as well as more flexibility with printing conditions if you can do without the strength and resilience of ABS. In simple terms, PLA is for hobbyist printers while ABS caters to those looking to produce commercial-grade parts that need to endure more rigorous wear and tear.